Leo January 2018 Horoscope predicts that social capabilities and adaptability are keys to achieve your objectives during the month. More than 80 per cent of the planets are in the western part of the horoscope. Though this is against the natural aggressiveness of Leo, you have to learn and live with it for the time being. It is advisable to look at your flaws in character which come out while dealing with others and take steps to correct them. Your aggression should not be used to get into fights with others. Beneficial aspects of planet Jupiter will be felt for Leo zodiac sign during the last week of the month. Legal wrangles will be settled in your favour and leisure travel is indicated. Students will do well in their academic career. 2018 horoscope predictions foretell that professional prospects are affected by the negative influence of Mars during the month. Things are moving at a slow pace and you have to remain calm and wait for good things to happen. Office atmosphere may not be enjoyable. The solar eclipse may induce changes in the job and there may be radical changes in the work place in January 2018. 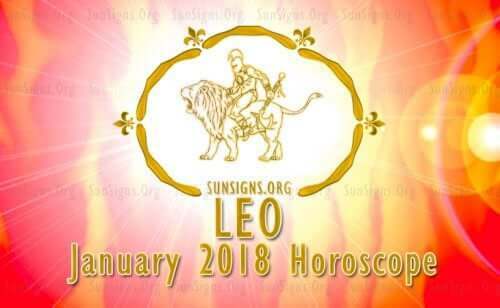 Leo monthly horoscope for January 2018 indicates that financial situation will be quite favourable and the Lions may gain money from speculations till the 26th. After that Mercury will not help you in your fiscal projects. Love Horoscope 2018 indicates that the House of Love will become powerful in the month of January after the 20th for the Lions. You will try to dominate your love affairs. Married persons and people in committed partnerships will have a stimulating and enjoyable time which may even lead to pregnancy. You will be having great fun with your family and children. Married persons and people in committed partnerships will have a stimulating and enjoyable time which may even lead to pregnancy. You will be having great fun with your family and children. If you are seeking romantic relationships, get ready for sudden and serious alliances this month. The opportunities are endless. You can refer to Leo sexuality. The solar eclipse will make important changes about the way you look and the way you want to present yourself to the world. All in all love and health will be excellent for Leo personality during January 2018. You have to limit your aggression and use your social skills to succeed. Also see Numerology 2018 Horoscope.